Supplement line of professional supplements, the use of which is associated with a large increase in strength and improved increments lean muscle tissue. The highest quality confirmed by many athletes! Mixture of three different forms of creatine to enhance physical performance during training! Crea line Core® - creatine stack based on advanced forms of creatine, including the popular creatine HCl (creatine hydrochloride), beta-alanine enriched in the patented form CarnoSyn®, which also affects the accumulation of lactic acid in the working muscles and thus reduces the acidity muscles during long training sessions. The addition of powdered seeds of fenugreek (Trigonella foenum-graecum L.) to give 4-hydroxyisoleucine is to assist extraction of testosterone, which influences the building lean muscle mass. 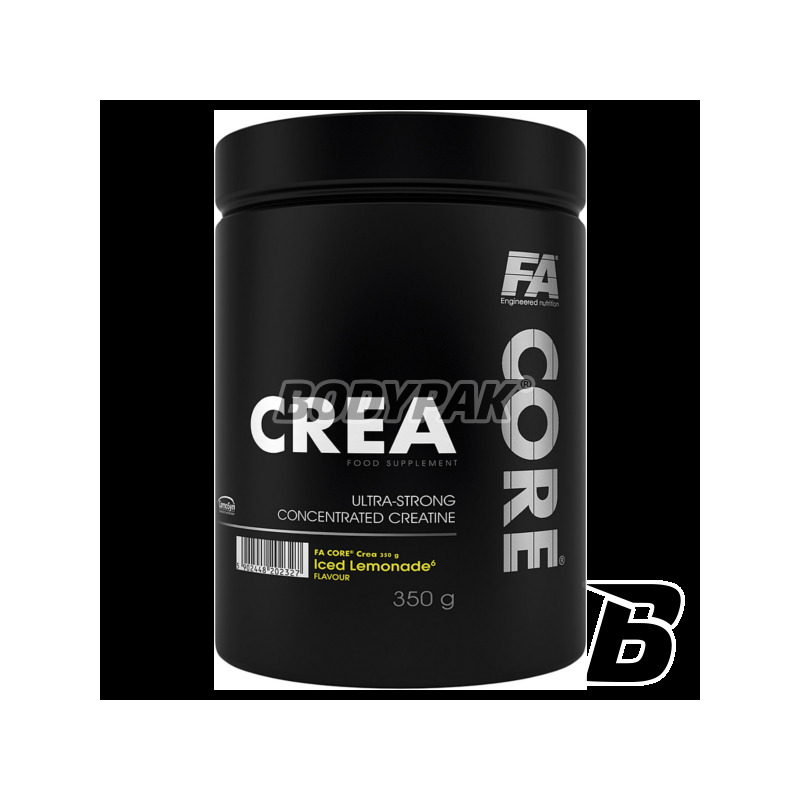 Any form of creatine used in the Crea has been added in a way thought to your training effects could reach the next level. Creatine Hydrochloride is a stabilized form of creatine hydrochloride. With this combination, researchers got the creatine, which is much more soluble in water than creatine monohydrate, which allows for better absorption of molecules in the body. In addition, creatine hydrochloride stability in any environment, acidic, neutral or alkaline. Stable creatine molecule does not require additional buffering substances to pass through the gastrointestinal tract, where the environment changes from acidic prevailing in the stomach to the base being in the duodenum. Hydrochloride creatine does not affect the distension that accompany supplementation . : e.g. creatine and does not require three-phase . : storage. Saturation of creatine HCl plasma cell extremely quickly due to its high bioavailability. Creatine Hydrochloride is the largest part of Crea line Core® and serves a key role in increasing physical performance in the case of successive short, very intense exercise. Dicreatine malate form of creatine is coupled to malic acid in a ratio of 2 molecules of creatine per molecule of malic acid. Compared with conventional malate monohydrate it is superior in solubility and in addition provides the body malic acid molecule which is a substrate in the transformation of the Krebs cycle leading to the production of energy in the cells of the body. This cycle is a key briefly next to the glycolytic metabolic pathway of the body, which is produced high-energy molecule ATP - adenosine triphosphate, which is the ultimate energy substrate for the working muscles. Providing the body with malic acid together with creatine, add in a straight line muscles extra fuel that no additional changes may be the substrate to produce the necessary energy for working muscles. Alpha-ketoglutarate Creatine is a combination of creatine molecules with an intermediate molecule Krebs cycle - alpha-ketoglutarate. As a result, the merger would increase the "energetic" connection and improves the absorption capacity of creatine in the body. The so-called alpha-ketoglutarate . : AKG like malic acid is an energy donor. Due to the excellent solubility in water quickly reaches the muscle where it is utilized. Moreover, it shows similar resistance to the acidic environment of the stomach as the hydrochloride creatine did not transform into an inactive creatinine. It does not require a loading phase. Beta-alanine as CarnoSyn® is a patented molecule beta-alanine. Amino acids in natural conditions are generally in the form of alpha-amino acids, but beta-alanine supplementation due to its properties appear to be appropriate and desirable. Beta-alanine in the body plays an important role in regulating the amount of current carnosine - a substance neutralizing the presence of lactic acid in the muscle developed due to intensive training, . Beta-alanine is an intracellular buffer which has a buffering capacity in hydrogen ions (pH stabilization muscle), wherein said donor is lactic acid. The hydrogen ions block the possibility of further work striated muscle by impairment of the nervous system communicate with the muscle tissue, which leads to the breakdown process in an efficient muscular contraction. Active Life beta-alanine is very long and approx. 40 days, so the possibility of its concentration in the muscles do not depend so much on the same amount of consumed, but since its use. According to a study admission of beta-alanine for a period of approx. 10 weeks increased muscle carnosine concentration to 80%. What does this mean for an athlete? Increasing muscle carnosine concentration of the second type (FTA FTb - fiber susceptible to growth by weight) by supplementation Crea line Core®, increases the possibility of the muscle fiber to absorb a larger quantity of hydrogen ions H + caused by lactic acid production, therefore, there is provided the optimal pH level. You can train harder and longer and using a balanced diet protein will achieve greater gains in muscle mass. Składniki: chlorowodorek kreatyny, jabłczan dikreatyny, beta-alanina, alfa-ketoglutaran kreatyny, aromat1,2,3,4, aromaty5,6, ekstrakt z nasion kozieradki pospolitej (Trigonella foeum-graecum L.), koncentrat soku buraczanego1,4,5, substancje słodzące (sukraloza, acesulfam K), substancja przeciwzbrylająca (E551), barwnik [(E160a)2,3,6, (E163)1]. Dotyczy produktu o smaku: Wiśniowy1, Ananasowy2, Gruszkowy3, Różowy grejpfrut4, Truskawkowo-aloesowy5, Mrożona Lemoniada6. Jedna z ciekawszych kreatyn. Trafiłem na produkt przypadkiem - ale nie żałuję bo się sprawdza bardzo dobrze. Przyrosty masy na plus, siła podobnie.. sprawdzi się na cyklu - polecam! Na prawdę produkt świetny. Siła na +, masa powoli też na +, POMPA +, zbite, jędrne mięśnie!